Legal Aid client poaching & hospitality racket in Scots Courts. 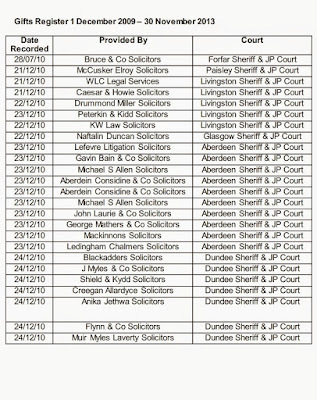 LAWYERS accused of making suspicious, erroneous or fraudulent legal aid claims appear among a list of high earning legal aid law firms in a register of gifts & ‘hospitality’ received by staff at the Scottish Court Service (SCS). The documents, finally disclosed to journalists after court bosses failed to convince the Scottish Information Commissioner it should remain secret – identify ‘significant’ hospitality relationships between law firms who have received tens of millions of pounds of legal aid, local courts and court employees right across Scotland. And it has emerged the extent of ‘hospitality’ to court staff is so great - some local courts have been the scene of ‘gift wars’ between law firms – with solicitors raising the stakes over rivals using hospitality to ensure business came their way at the expense of competitors. The extent of gift giving in exchange for business referrals - raises questions over whether it is appropriate for court staff – who run the courts at taxpayers expense - to enter into hospitality relationships with solicitors who have a stake in dragging on court cases to beef up their fees and claims for legal aid. And, some law firms on the list have been implicated in allegations of questionable legal aid claims. In other cases, law firms , activity resulting in criminal charges against staff. In one case, the law firm of NS Lockharts Solicitors – run by Niels S Lockhart - a sole practitioner in Kilmarnock who was the subject of a Scottish Legal Aid Board investigation into huge sums of legal aid claims of over £600,000 in three years also appears in the list. NS Lockharts Solicitors are identified as providing hospitality to local court staff in Ayr Sheriff Court. Lockhart ‘withdrew’ from the legal aid register after an investigation by the Scottish Legal Aid Board. In another case of gift giving between lawyers on the legal aid ticket and court staff - the law firm of Bell & Co Solicitors are also identified as hospitality providers to staff at Kilmarnock Sheriff Court. However, Bell & Co hit the headlines two years ago when one of their Paralegals – Arlene Reid - was jailed for two years - for embezzlement and mortgage fraud totalling £87K after Reid defrauded her own employers and the Alliance & Leicester Building Society. Gifts Register identifies Scots law firms ‘hospitality’ to court employees The list of law firms, together with a list of hospitality released by the Scottish Court Service identifies law firms who receive millions in taxpayer funded legal aid every year. Hospitality on the list ranges from boxes of chocolates, alcohol, invitations to dinners with the ‘vested interests club’ - top lawyers, law firms, the Faculty of Advocates & the Law Society of Scotland, big business hosts & even “Royal Garden Parties”. Other hospitality include trips on boats, gift vouchers for high street stores, dinner parties with Police, and - bunches of flowers. The extent of hospitality relationships between court staff and law firms have raised suspicions SCS staff are providing lawyers & law firms with personal favours in return, which in some instances are leading to criminal cases ‘taking their time’ through the courts owing to overly friendly relationships with local law firms & local court staff. Information has also been provided to journalists – alleging undeclared financial relationships between court staff and law firms, in relation to the purchase of properties & land, provision of free or discounted legal services to SCS staff in their personal legal affairs, and instances of SCS staff providing return favours for solicitors when asked to do so. Speaking to Diary of Injustice earlier today, a solicitor from a law firm which has provided small amounts of hospitality as a matter of courtesy and thanks to local court staff, said he was aware some law firms were offering additional gifts to SCS staff as a way of drawing in business. He described the situation as “unfair practice”. The solicitor told DOI he was aware of several cases where court staff received discounted or free legal services – from law firms who were taking clients from others including his own firm. And. in an example of law firms poaching each other’s clients using hospitality to court staff – DOI uncovered a case where ‘regular’ criminal legal aid clients of one law firm - were allegedly directed to another law firm by a court clerk in receipt of ‘hospitality’. However, the switch did not result in a good move for the clients - who ended up jailed for minor criminal offences after a trainee solicitor from the law firm they were sent to – messed up their defences and pleadings. In an earlier investigation by DOI, it was revealed Gillian Thompson OBE – now the Judicial Complaints Reviewer (JCR) – authored a report on undeclared relationships between employees of the Scottish Court Service, law firms, and other vested interests. The report, published by DOI – revealed court staff are making money on the side via relationships with law firms. 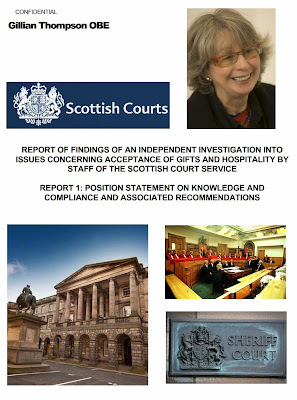 Diary of Injustice reported on concerns regarding hospitality involving Scottish Court Service employees where Ms Thompson was asked by the Scottish Court Service to investigate reports of irregularities in hospitality given to court staff. The request for the investigation came after the SCS received Freedom of Information requests regarding hospitality in the courts, prompting concerns some staff may have accepted gifts or hospitality but failed to register. However, the request – from DOI – triggered a review of hospitality policy at the Scottish Court Service, leading to names of ‘'hospitality’ providers being added to the register. DOI journalists took the matter up with the Scottish Information Commissioner – who requested Courts Chief Eric McQueen provide an explanation as to why the courts were blocking release of information on hospitality relationships between the legal profession and court staff. What a bunch of creepy crooks? What is the world coming to when lawyers have to bribe court staff to steal clients from other lawyers! DOI uncovered a case where ‘regular’ criminal legal aid clients of one law firm - were allegedly directed to another law firm by a court clerk in receipt of ‘hospitality’. Haha serves them right whatever they did.Jail the lot and jail the court workers taking the hospitality and jail some of those lawyers for taking all that legal aid! No wonder they did not want to hand over the info looking at the entries for Aberdeen sheriff court. It is a mess at the best of times now revealed full of hospitality junkets. No need for anyone to now ask by the courts are slow! Too busy taking gifts/BRIBES to get any real work done! Regarding clients finding their way to other firms I suspected as much however always difficult to prove until now.Will take this up further and thanks for your diligent work. How about the sheriff clerk married to the cocaine dealer who hid her husband's drug stash after she was tipped off about a search warrant.Wonder why they forgot to enter it in the hospitality register.Look into it will you? More legal aid lawyers milking the system for their own benefit.If Scottish Legal Aid Board want evidence surely there is plenty in the documents to get going with a review of this hospitality (bribes) for legal aid. Help me get some legal aid biz and here are tickets to the opera etc yes I can see this being the case the way you wrote it up. So what is to be done about this blatant corruption? Hmm I see they altered the terms of their hospitality register to identify the provider after your investigation. Nice one!Make some more trouble please! The Scottish Legal Aid Board now have a copy of the hospitality providers to SCS staff. Excuuuuse me! but this corruption is getting too much to bear! Where is the great mister top judge when all this "hospitality" as in bribes is going off! We are all told the great Brian Gill is head of the courts but he doesnt seem to be policing it very well eh when it takes the Diary of Injustice team to bring changes to the rules instead of the so-called top judge. Maybe you better not call him a top judge any more if he is not doing anything about it! 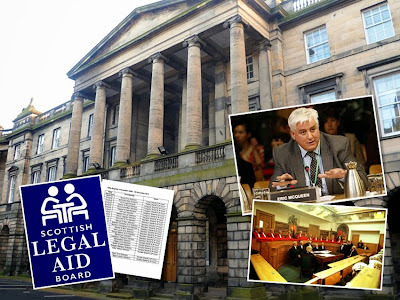 SLAB will do nothing about this stunning corruption because they are run for the exclusive benefit of the all powerful Law Society of Scotland as a salary inheritance for Scotland's hoard of lawyers? Another scandal on pensioner Lord Gill's watch? It's almost as if it is deliberate? SCS said you had this for some time.Not too happy you wrote it this way.Why the wait to publish? Unlikely ... on both counts. Time was given for an investigation and some of what the firms discovered and decided to comment upon is featured in the article. Too bad for them.How about making it so no hospitality/BRIBES are offered to OR accepted by court staff! The Scottish Judicial System is irrevocably broken and hopelessly corrupt. All the players are snatching at the cash like sharks in a feeding frenzy. Any "public officials" who have been caught receiving perquisites should be sacked on the spot along with the Scottish Judges and Sheriffs who DOI told us were convicted felons but Lord Gill has refused to allow their names to be released, so they can take public money as a salary under false pretences, notwithstanding that they have shown that their judgement is impaired because they have chosen to break the law. "some of what the firms discovered and decided to comment upon is featured in the article"
An interesting list of firms and those gifts are not given out of courtesy.Something is expected in return and I am sure it is as you say.Far too much money involved for it to be otherwise. I see from the documents the Chief Exec of the Scottish Court Service is also mentioned as a recipient of hospitality. Given the courts are supposed to be a venue where persons are supposedly guaranteed a fair hearing in civil or criminal trials it is not appropriate for this to continue. Maybe all of this corruption has gone to the heads of these court officials, for when a member of the Scottish public telephone a court for information they are treated with utter contempt and rudeness? So much for serving the people? Apparently some of my colleagues at the SCS are going through your list trying to work out who tipped you off! Keep digging there is plenty more of this 'hospitality' going undeclared as I am sure Ms Thompson OBE realised when she wrote her report. Funny in a way because lawyers who realised their clients were going elsewhere only got to find out what was actually happening after they saw this list. If employees of the court service are on the take to this extent it is difficult to trust anything happening in the courts including the opinions of judges who are guided by these same court employees. So the SCS dragged kicking and screaming to comply with a perfectly reasonable request by DOI to provide it with information of Public interest. Thank goodness for your tenacity - another feather in DOI's cap! The only proper hospitality rule is to allow none! This would be achievable if those at the lower end of the pay scale were paid a decent salary - something those at the top, such as the Judiciary, have long enjoyed. A colleague who reads your blog told me he offered a box of chocolates to a member of staff at Edinburgh sheriff court and she told him the chocolates were an insult for all she had done for him in the past.She made it clear she expected more. If you take a look at the current rules relating to hospitality the SCS staff are not supposed to ask for gifts.They are asking for gifts and expect it. Good point and yes the courts are too corrupt now to be trusted especially with all these bribes swilling around. Can someone tell me why it is that the Scottish Judiciary and Scottish Courts have rules but do not pay a blind bit of interest in complying with them and that this behaviour is rewarded with zero remedial action against them for doing so? They are just like the Scottish lawyers. Screw the Scottish public for as much as they can because they are being allowed to. Is this bribery in the courts just limited to Scotland or do we have similar here in England too? I am surprised they released all the names of the law firms to you - if you go through them as you say a lot of legal aid earners. Have SLAB been on to you yet? It must be obvious there is a connection between legal aid and gifts in that list to the point a proper investigation is required. I remember not so long ago the staff were om strike standing outside the courts with big posters pleading for salaries and conditions - no mention of hospitality and bribing for access! The SLAB is run by the Law Society for the Law Society and as such are above the law in Scotland. The SLAB is a Scottish lawyer's opportunity to print out as many £ Notes as possible for self enrichment. The report by Gillian Thompson is enough to brand the staff as crooked and your foi with all the law firms is the icing on the cake. Hospitality to court staff must be abolished because it is obviously being used as bribes for favours. So this did not happen did it.Just look at the list and easy conclude everyone is getting some kind of bribe! Haha Peter you don't half shake them up!Good for you standing up to these toads! Exactly why rules must be put in place forbidding hospitality of any kind whatsoever. It is well known that Gillian Thompson is a Law Society of Scotland lackey, so if these findings are to be measured against the truth, then the problem must be infinitely worse than reported? So, where are the police? What is the point of having any written down rules, when they just ignore them anyway in their all out pursuit of CAAAAAAAAAAaaaaaaaaaaaaaSH? Lord Gill should be forced to reveal the names of the court bribe takers and they should all be sacked? We can no longer tolerate a system that awards bribery and corruption? The lawyers who have sought to bribe court employees should be named and sacked? Last week I heard a story about a worker in the Edinburgh court who had their mortgage paid off by a lawyer after they helped cover up and put a stop to a case relating to £800,000 stolen from a family trust so you are right they are taking bribes and this is affecting cases and people getting access to justice. The judges cannot be ignorant of this they must know and are covering it up or are just as much on the take as their own workers. No signs of life at SLAB investigating links between hospitality & legal aid ... but if they do, DOI will report on it. Scottish court workers do not only look a gift horse in the mouth, they are actively brushing it's teeth. What is Lord Gill's excuse this time for a failure to act? Could be your most damaging article in the past few weeks as have heard a lot of worried folks at SCS talking about their take being exposed by yours truly.. This is pure corruption and you have blown the lid off it.Well done. If you wanted to do some damage this was the post that did it.